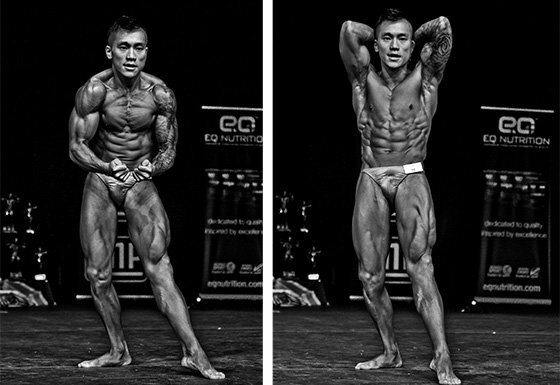 Body Transformation: Vinnie Duong Cut Down To Pure Muscle! Fat stood no chance against Vinnie's all-out mentality to get shredded. Check out the tactics he used to eviscerate 19 percent body fat and reveal chiseled muscle! I had never been happy with the way I looked and it was time to change. In January 2013, I decided to start my transformation. My grandmother died on New Year's Eve, so I was motivated to change my mindset and get out of depression too. I set a goal to compete in 2013 as a joke after my manager at work said I should. I agreed, but never thought I would reach it. As I got leaner, it all started to come together. Before I knew it, I entered my first bodybuilding competition and was learning to pose to show off my hard work. Initially, my new lifestyle and eating habits didn't affect my social life. I still meet up with friends and my girlfriend for food and drinks, which was a key component of my success. Behind the scenes, I never starved myself; I restricted my calories to allow space for treats. I feel happy with my looks and am in the best shape ever. I've got much more confidence and belief in myself. I have to thank everyone that gave me positive reinforcement. I have so much appreciation for the comments I got during my journey. I still get compliments on my physique and store them in my memory. The world would be a better place with more positive people opposed to those who constantly put you down. Changing my lifestyle made me more organized and focused. It almost gives me an invincible feeling. I feel that I can conquer anything set in front of me. I learned that I'm stronger than I thought I was and that anything worth having is worth working hard for. I changed my daily target calorie intake to 2800. Keeping a food diary and tracking what I ate played a key role in my success. Everything that passed my lips was noted and I always carried a scale. I lost a steady 1-2 pounds per week. When my weight loss began to slow, I made small changes to my diet to burn fat again. I also took monthly progress photos and recorded my weight. During my transformation, I came across difficult times and craved food. I tried to keep myself occupied to divert the thoughts. After overcoming my cravings, I was on the path to success. Lots of my drive and inspiration was derived from personal goals. I give it all or nothing. When I started my journey, I knew that it was a one-way journey. I published my progress on social media to give me more focus and support. This helped me push on as if there was an imaginary spotlight on me. Dieting was hard when my calorie intake got lower than 2000, but it was worth fighting for. You have to want something enough to push through the hard times to succeed. At the end on the day, you'll be happier knowing that you achieved what you set out to do. Be patient and take it to the next level to reach short-term goals. "Be patient. Be consistent. Do it for yourself." My plan is to reverse out of my diet by slowly increasing food intake so I maintain a steady weight. I plan to put on a couple pound per month to get stronger and build more muscle. I will enter more competitions in the near future and try to better myself again. Be patient. Be consistent. Do it for yourself. Bodybuilding.com provided me with a massive amount of information on workouts, nutrition, motivation, and products to give me a head start. Without Bodybuilding.com, I don't know where I'd be. The site has great articles and motivational tools that kept me going year round. I also have a BodySpace account that I use to stay on top of my new lifestyle. It helps me track goals and progress and allows me to post progress pictures. BodySpace is a great motivational tool.